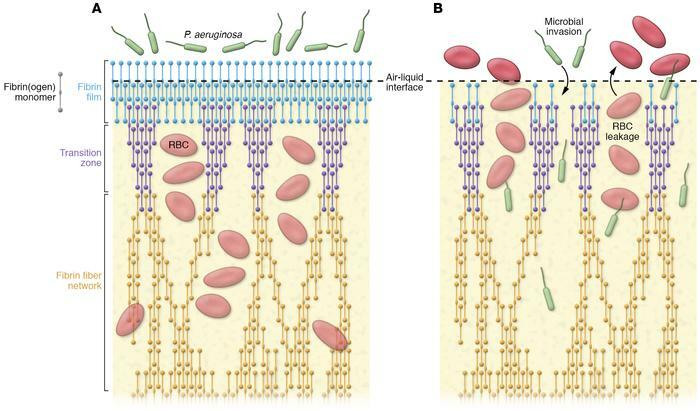 Structure and function of fibrin films. (A) Schematic representation of a film composed of fibrinogen and fibrin monomers forming a continuous 2D sheet at the air-liquid interface. Tethering fibrin protofibrils extend through a transition zone into a network of branching polymeric fibrin fibers. The fibrin film functions as a barrier at the external clot surface to RBC and prevents microbial invasion into the wound. (B) Disruption of the fibrin film allows infiltration of microbes such as Pseudomonas aeruginosa and leakage of RBC. Blue: fibrin D domain; red, E domain.